These illustrated case studies have been written by Gren Hatton. They summarise the work and findings of several CLASP projects in a uniform printable A3 format. They are .pdf files. To print them onto A4, open them in Acrobat Reader and “fit” the page to A4: print Two-Sided, set to Short-Edge Binding, to produce a single-sheet, folded A4 brochure. An alternative is to NOT use “Two-Sided” printing. Print just the first page; then reorientate the paper, reload it and print the second page. 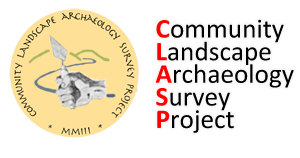 The archaeological research by CLASP at Harpole has been an important contributor to CLASP’s Local People Local Past project across west Northamptonshire. The villa excavated at Harpole is the only double-courtyard villa in the area and is relatively rare. The overall complex was huge. Further research work will hopefully be agreed in the future. In the meantime this case study provides an initial interpretation of this site. During eleven seasons of fieldwork at the Whitehall Farm site in the parish of Nether Heyford, in west Northamptonshire, members of CLASP excavated and recorded details of more than 600 years of the history of a rural hilltop community. The work revealed a gradual progression from Late Iron Age roundhouses, through various stages in the development of a Roman-style farm with villa and bath-house complex, to the eventual abandonment of this complex, levelling of the site and construction of a British-style timber hall, following the turbulent century after Rome’s final withdrawal from Great Britain in AD410. The opportunity for CLASP to carry out a multi-discipline archaeological study across a wide area of the Bannaventa site contributes significantly to this relatively neglected area of the study of Roman Britain. The project combines data from earlier work with new fieldwork using modern techniques – fieldwalking, metal-detection and geophysics surveys, analysis of historic aerial photographs, and some trial excavations. Despite fieldwork at various Roman sites in west Northamptonshire, there has never been any previous multidisciplinary attempt to provide an overview of the finds and sites identified, or any explanation of the general development, the nature of settlement or the character of Romanisation of the area. CLASP therefore set out to remedy this, in the ‘Local People: Local Past’ project. The results are contained in detailed reports that may be downloaded from other parts of CLASP’s website – the case study provides an overview of the methodology and presents the key results in accessible format. Barby Hill projects noticeably into Warwickshire – the county boundary follows the stream in the valley below the hill – suggesting that the hilltop was probably a significant location long before the shires were established in Anglo-Saxon times. Such clues — together with the discovery of Iron Age roundhouse circles during work to extend the water reservoir on the hilltop — led CLASP members to set up a research project, which surveyed most of the flat hilltop and hillsides, and carried out trial excavations. The findings, published in annual reports, aroused the interest of professional archaeologists and county authorities alike, and have led to a new appreciation of Barby Hill’s significance. CLASP’s Iron Age Hillforts project covered the whole of Northamptonshire and provided individual survey reports for each hillfort site to Oxford University. The case study on this project gives a summary of the project’s aims and achievements, and includes examples of some of the analysis and interpretation contained in the full CLASP report on the project; the full analytical report is also available as a download from CLASP’s website, along with copies of the individual survey reports on each of the hill-fort sites included in the project. In the ‘Local People: Local Past’ project, CLASP provided an overview of the general development, the nature of settlement and the character of Romanisation of a large area of central Northamptonshire, between the Roman posting stations at Bannaventa (Whilton) and Lactodorum (Towcester) on Watling Street, extending eastward towards a third Roman ‘small town’ near Duston (Northampton). Within this larger area, a separate fieldwork survey was undertaken to study the development of the hinterland around Lactodorum – and this case study presents the main results, showing that the Lactodorum area developed significantly earlier than the Bannaventa hinterland.